Sometimes, it is what is being “masked“ on stage that actually helps our clients create the most extraordinarily spectacular looks. This past holiday season, we were delighted to work again with Robert Polk and the amazing folks over at First Baptist Church in Jackson, MS. 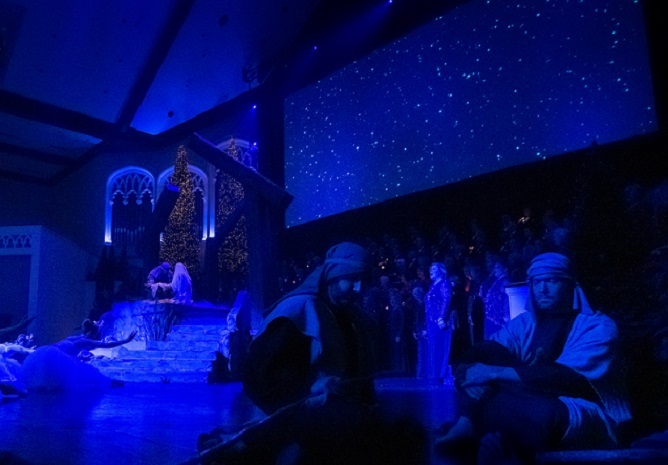 They produce the most incredibly inspiring “Carols By Candlelight” holiday production every year, and we are always thrilled when our beautiful rental drapes are selected to be a part of their set design. 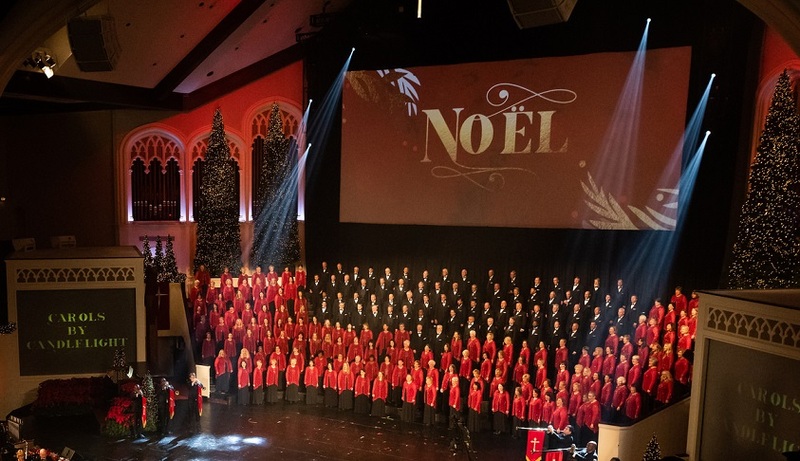 Already displaying a multitude of beautiful holiday ornamentations, twinkly lighting, magnificent staging, and even larger-than-life Christmas trees, they needed to “mask off” the huge screen on their center stage so that the rest of the décor could really pop. 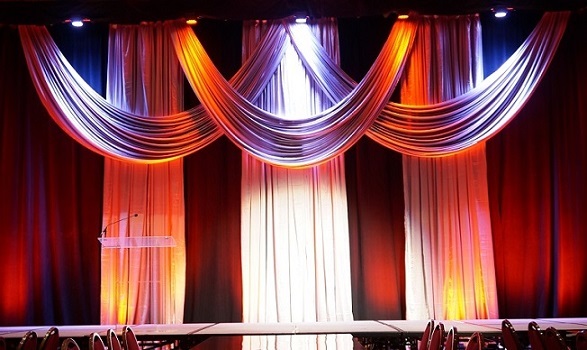 Sharing the stage with a phenomenal orchestra, exceptional choir, gifted ballet dancers, and even talented actors, these drapes assisted with their stage design’s overall motif without distracting from the performances at hand. By providing them with a variety of rich, black IFR 15oz. 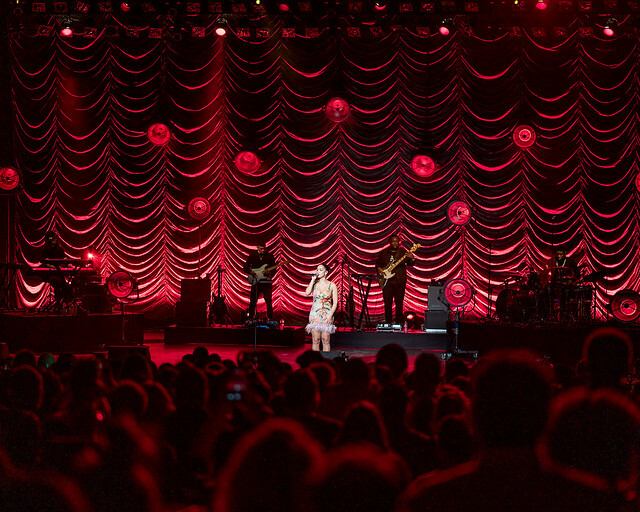 Encore Velour masking rental drapes (from 12’h to 40’h), they were able to surround this sizable screen completely. 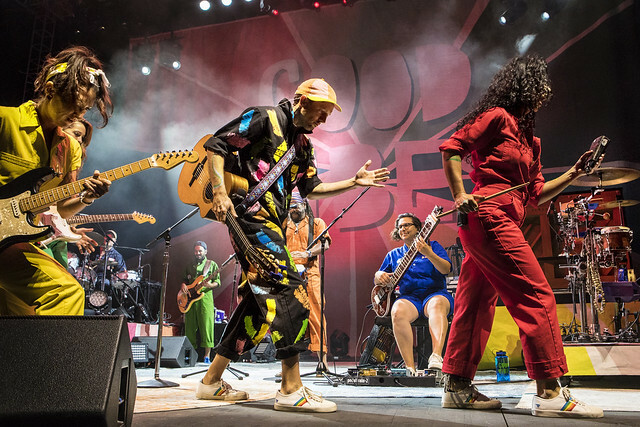 This enabled them to focus everyone’s attention on the video and imagery being projected onto the screen during key portions of their remarkable program. 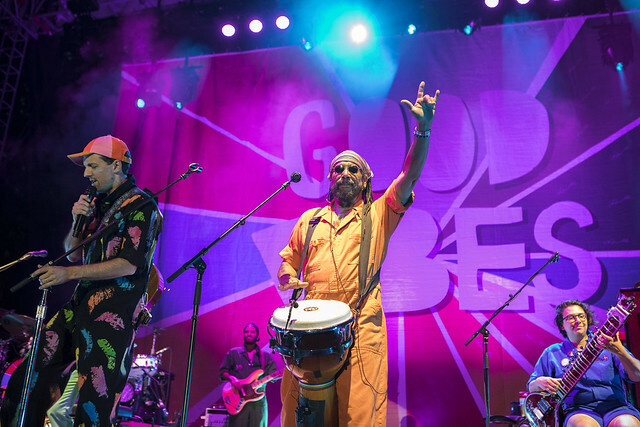 You can see with these stunning photos taken by Rushing Images how effective the masking drapes were in aiding their event designers in creating memorable looks for each unique part of the show. Durable, velvety, and versatile, these drapes can ship directly anywhere and for any purpose that you might need them. Arriving to your doorstep in sturdy drapery bags or dependable drapery hampers (packaging does not cost anything extra), these drapes can be used in a wide variety of ways—everything from stage masking, seat covers, truss borders, and neatly sectioning off larger areas into smaller ones. 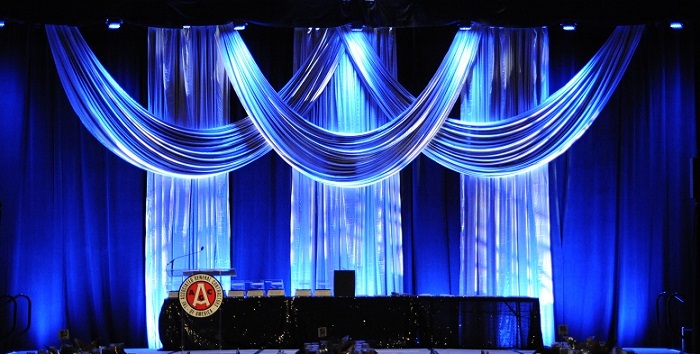 Give our reps a call or email today and let us assist you with some beautiful, multi-purposeful stage drapes for your next special event, whether it be significant or more intimate—we’ve got the drapes for you! We were recently very excited to get to work with one of our extraordinary local clients, the President and Chief Designer of Spark Creative Events, Lani Ballonoff. 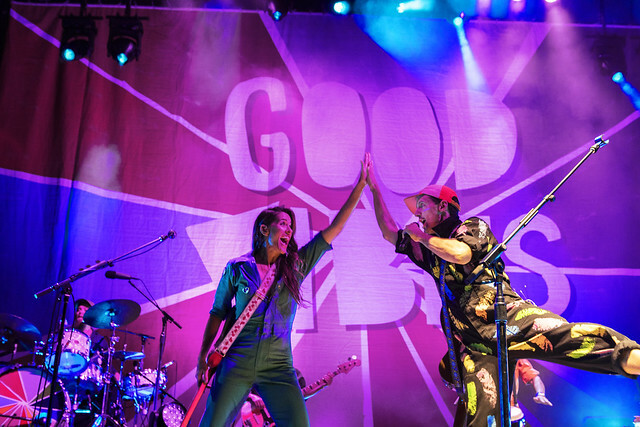 He needed to help set the stage for an exceptional fundraising event that they were designing for the “Kids Helping Kids Benefit Show” at the beautiful and historic Granada Theater in downtown Santa Barbara. 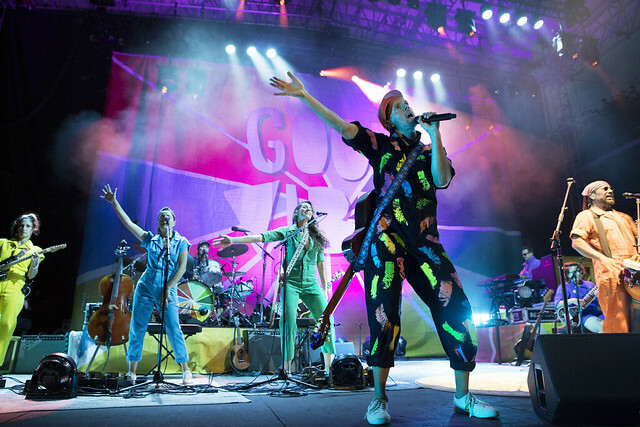 They needed curtains that would have a spectacular larger-than-life appearance, but be versatile enough for them to fashion new and exciting looks throughout the course of the show. 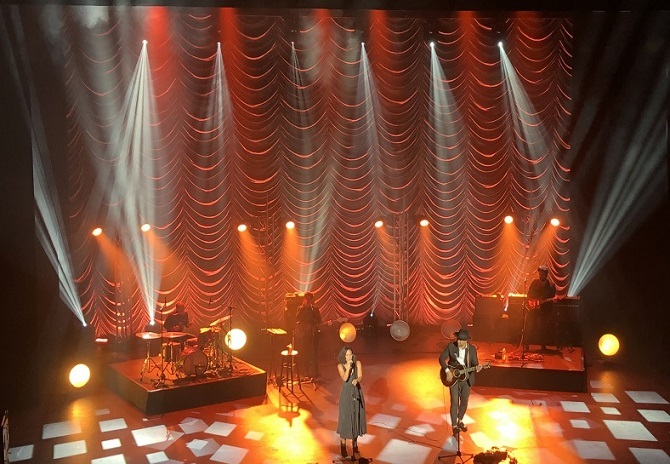 They specifically needed a unique backdrop that they could use during the engaging performance of the event’s live entertainment, the dynamic duo Johnnyswim. The perfect solution was having Spark Creative use three of our gorgeous rental 30’h x 16’w IFR “Cloud” Satin Austrian Zip-Walls from our Silver Satin Drapery Collection. 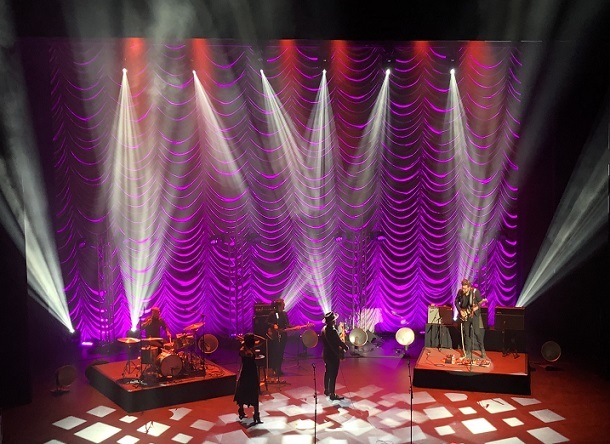 These drapes enabled their team to simply yet effectively create several sensational motifs that would showcase the benefit’s stage design beautifully. By lighting these curtains with a multitude of color schemes, the event’s impressive lighting designers were able to play around with different ambiances by simply mixing up the color palette and saturations. 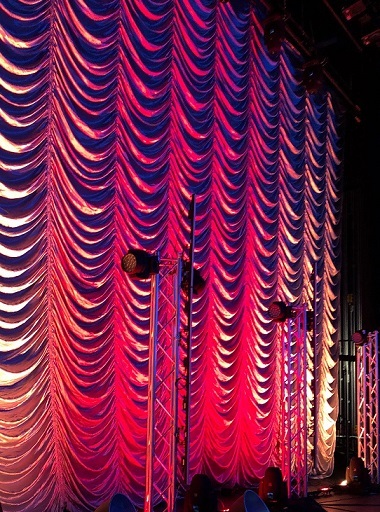 These theatrical stage curtains gave the design a fresh and exciting look throughout the entire event. You can see how a little change of color can also effectively change the entire feel of a design, as these drapes reflect any light splashed on them remarkably well. What makes our Austrian Zip-Wall draperies so distinctive is that they allow you to literally build an entire wall length of this lavish draping by zipping them flawlessly together. 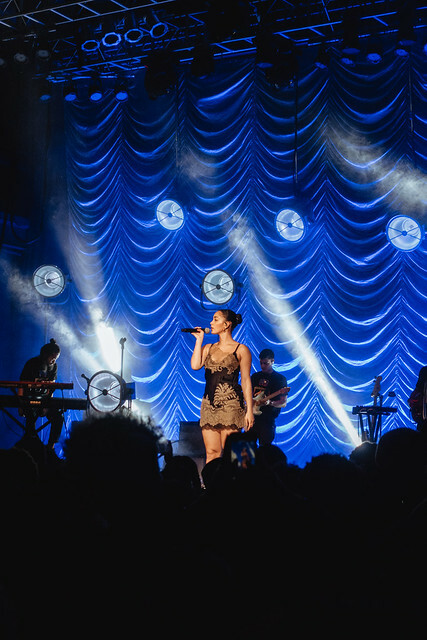 They can either zip together to produce a stunning seamless backdrop, or be used as independent legs to add texture and depth to an existing event design. This durable IFR fabric is opaque but still amazingly lightweight and plays with theatrical lighting superbly. 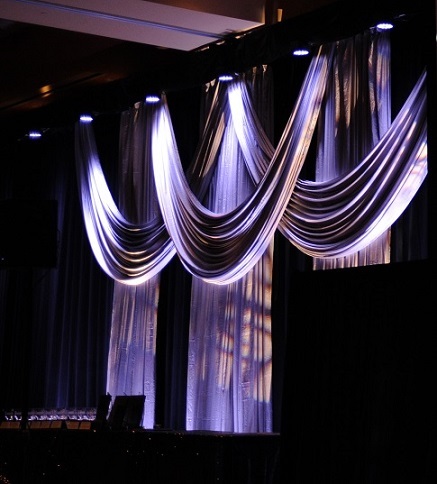 These drapes will reflect whatever kind of dramatic theatrical lighting you use on them, helping make your event design even more amazing. 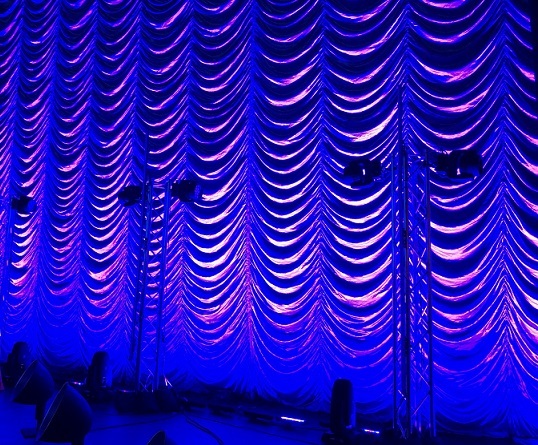 We love being able to work with our incredible clients, like the artistic team at Spark Event Creative, by providing them with the theatrical curtains needed to create the exact vision that they are going for. Nothing makes us happier than helping offer our clients innovative design ideas to be used for extraordinarily important philanthropic charity events like this one!